These snack-sized treats are totally irresistible and are perfect for an Easter celebration. Our oven fresh muffins, scrumptious cookie and brownie snackers will be sure to go fast, so grab one when you can! 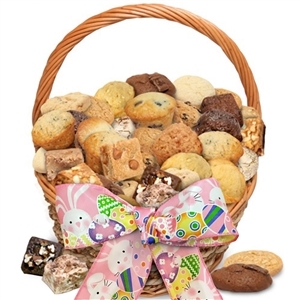 We'll send a charming wicker basket filled with eighteen mini muffins in assorted flavors twelve scrumptious cookie snackers and six of our scrumptious brownie snackers in our most popular flavors. When all the treats are gone, be sure to enjoy the woven basket which is lined with plastic that doubles as a planter. Of course, all of the goodies are individually wrapped servings for the ultimate in freshness. A free gift card is included.